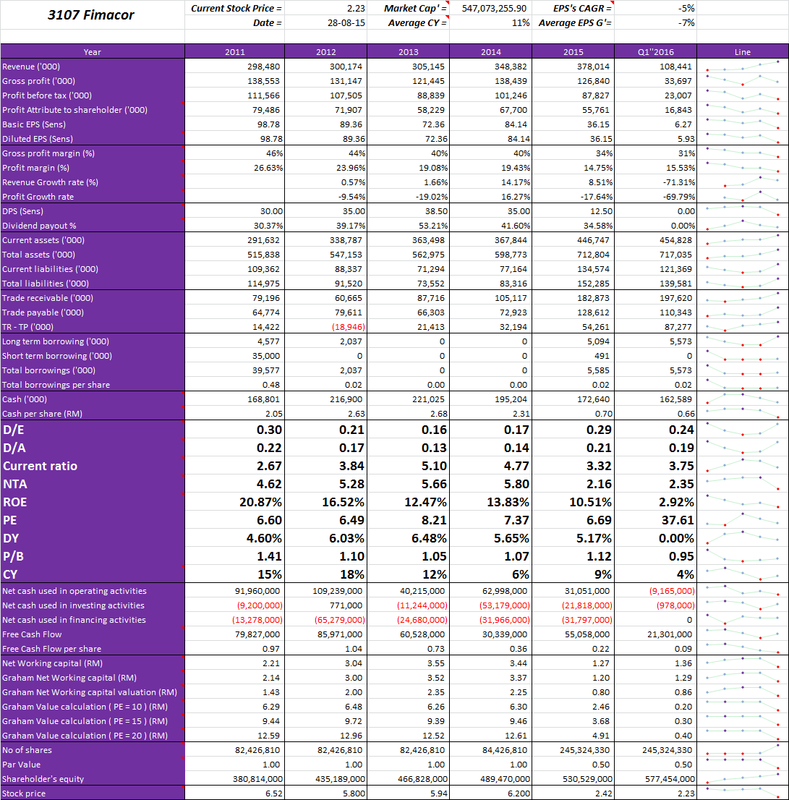 Month March to June is the Q1 report of company. Core business is Printing and Trading of Security and Confidential Documents. Secondary business is Oil Palm Plantation, located in Indonesia, PT Nunukan Jaya Lestari. Third business is Property which is Plaza Damansara Buiding. 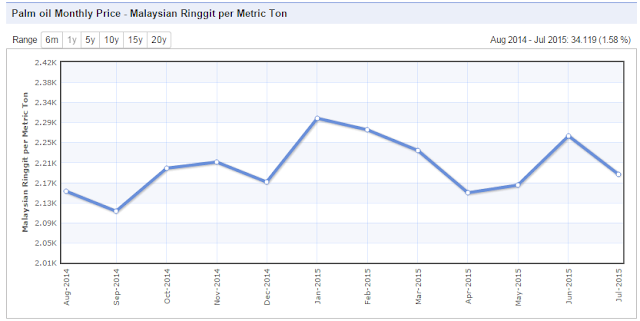 Kumpulan Fima, KFIMA (6491) is mother share of Fimacor due to indiect 60% shareholding by Fima Metal Box. Challenges faced Fimacor are weak Malaysia Ringgit and CPO commodity prices. Security and confidential documents business should be stable for Fimacor, so the one thing to be worried is the oil palm plantation. Biological assets amounted to RM 44,877,000 in AR2015. It is increased to RM 45,212,000 in latest Q1''2016. 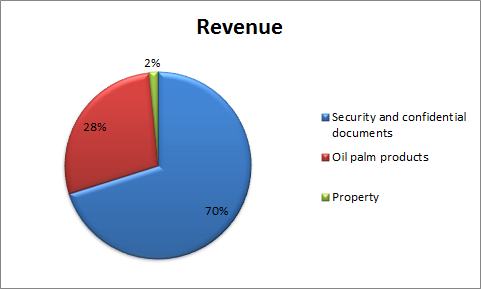 Profit before tax margin of confidential document, oil palm and property business is estimated approximately 16%, 29% and 20% respectively. Fimacor is a pure zero borrowing company. Latest cash per share is RM 0.66 and this is net cash per share of company is RM 0.64. With criteria NTA 2.35, Fimacor is undervalued by RM 0.12 or 5%. ROE is maintained above 10% level. DY of Fimacor also maintained above 5%, dividend investor's favorite. Fimacor's volume transaction in stock market is low. End of year 2014, Fimacor acquired Gabungan Warisan Sdn Bhd and Next Oasis Sdn Bhd. This acquisition activity aim to expand company's plantation land bank. Plantation expected maintains high fresh fruit bunches production in coming year. Compared with revenue in 2014, Security and confidential documents, Plantation and Property business recorded 10%, 4% and 1.5% in growth rate respectively. First time Fimacor buy back its shares after year 2009. Buy back activity on 17th and 18th August at price 2.2 and 2.22 respectively. Latest treasury shares of Fimacor are 3,935,100. For revenue part, there are 72% located in Malaysia and others 28% are located in Indonesia. The land area for oil palm plantaion in Indonesia is 46,642.90 acre. Its net book value worth RM 29,985,856. So NBV per acre is RM 642.88. On the other hand, the land's revenue per acre is RM 2269.24. It is 3.5x of the NBV per acre. Fimacor's plantation division located at Indonesia. It may competitively but few advantages will take by company. 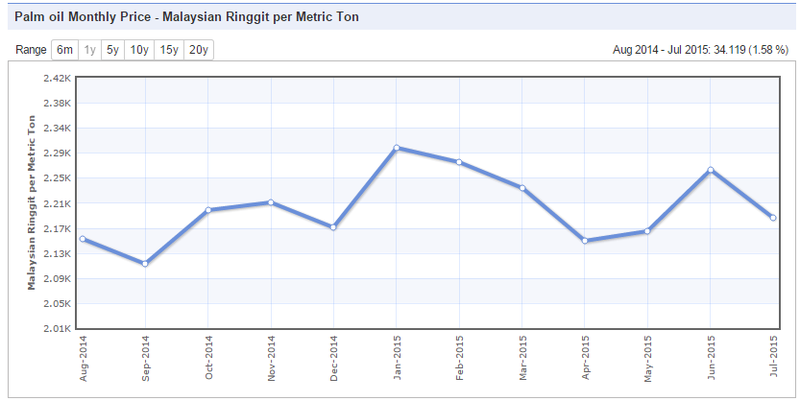 Average Palm Oil price is REM 2203 per MT. A 7.5 sen or RM 0.075 final dividend going ex-date on 22/9/2015. 1. Reason long term borrowing digit in AR2015? 1. Is is belong to two new acquired subsidiaries, that is Gabungan Warisan and Next Oasis.